Stuart Jones meets a man who lives for the challenge and gets results through his own way of doing things. Kenny Walsh says it himself, he’s eccentric. His approach and his sense of humour are different to most other people’s. For him, it’s all about setting up challenges, some of them bizarre, and overcoming them through his ingenuity, determination and the skills he has doggedly acquired over years of varied experience. Don’t be taken aback if he says he’s going to ‘kill it’ or something similar because he has a different lexicon to most of us; it means he’s going to get the job done, and he will. After leaving and working with his brother for a while, his next job showed his willingness to take on challenges he had no way of knowing he could deliver on. He asked Ford main agent H.E.Nunn for a job and was asked what he could do, replying ‘anything’. They offered him a job starting on the Monday and when he turned up he found it was on commercials, which he had never previously worked on. Fortunately they put him with an apprentice for the first week who helped cover for him and he stayed late every night learning about commercials and gradually he picked it up. He volunteered for all the difficult jobs, hoping it would make him indispensable. When the dealership closed, he went to another garage and here he was lucky not to be killed when, lying under the tilted cab of an old Ford, he turned on the ignition and discovered it had been left in gear as it shot forward, across the yard and through a wall, bringing the cab down on top of him. His injuries included a left hand that needed stitching up and a damaged left shoulder but despite this he turned up for the work the following two mornings, only to be sent home again. Finally he persuaded the foreman to let him do lighter duties though he had to use his right hand only for the next six months while his left hand healed, which wasn’t easy because he was left handed. Following this he had a number of other jobs, ran businesses of his own, getting first his truck and then his PCV driving licences, spent a miserable six months driving for an asphalt company, occasionally ran a coach, once ran a skip business alongside his day job and continued to learn all he could about commercial vehicles. In the early 1990s he had a spell with Dennis’s of Dukinfield who later sold out to Stagecoach. There are hundreds of stories he can tell you, but for sheer bloody minded determination the one about an epic four day trip to Babbacombe and back to recover a coach using a recovery truck that had been in a scrapyard for years takes some beating. For some reason the guy who accompanied him never volunteered again. 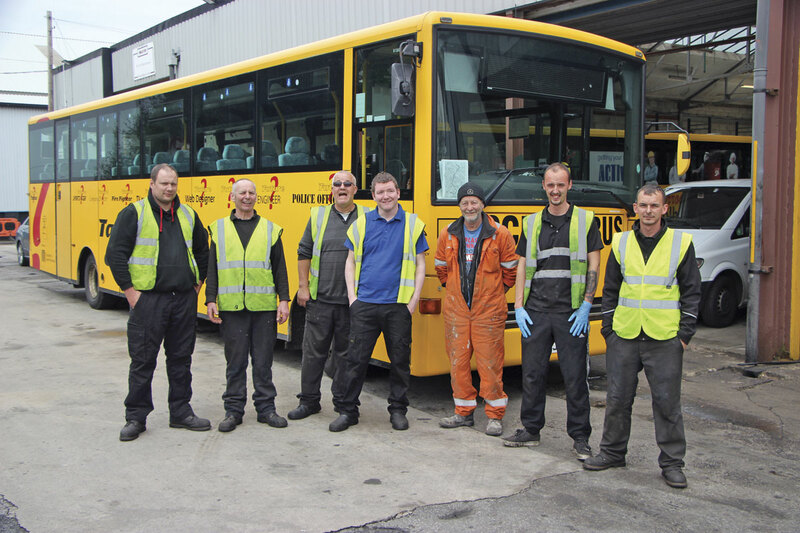 Fifteen years ago he started working for Belle Vue Coaches, initially in addition to other jobs, in the days before Phil and Ian had a garage of their own. It was a far cry from the current set up with two two-bay workshops and a 12-bay unit that has just been taken on. 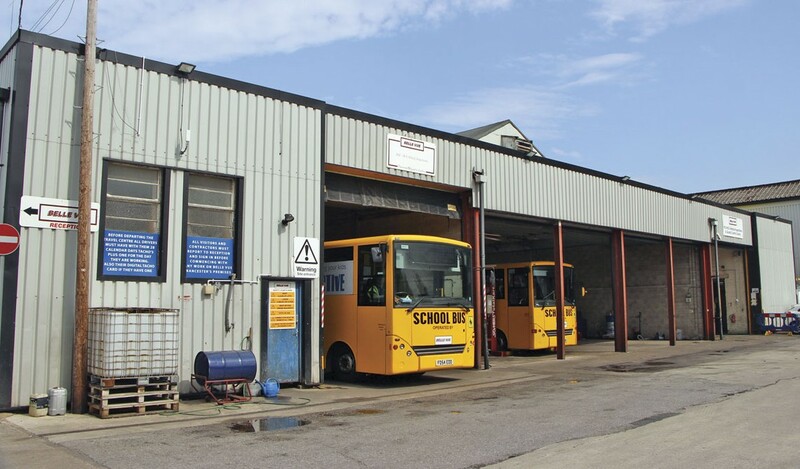 The plan is to convert one of the two bay units into an ATF, the go ahead for which has now been given by the DVSA. The workshops are now solely focussed on the Belle Vue fleet, though for some time they did undertake outside work to justify the cost when the fleet was smaller in number. The workshops are open from 6.00am to 10.00 pm. 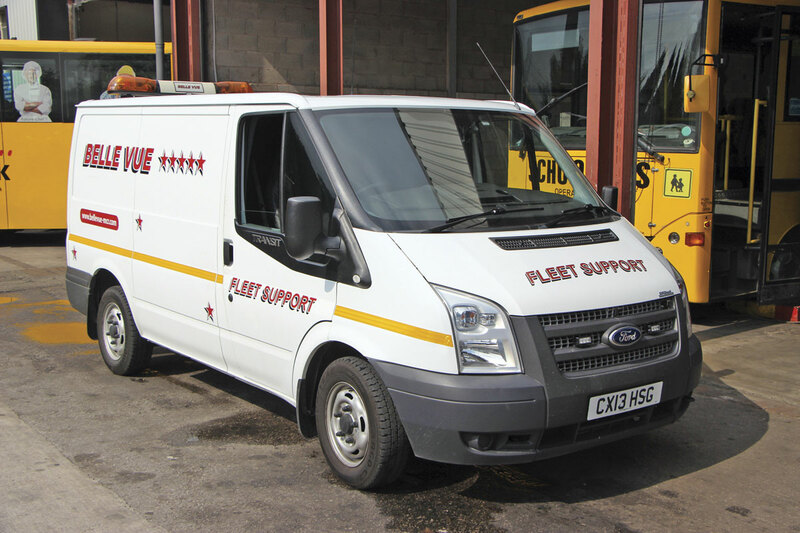 In addition, there are two fully equipped service vans that can be on the road 24/7. 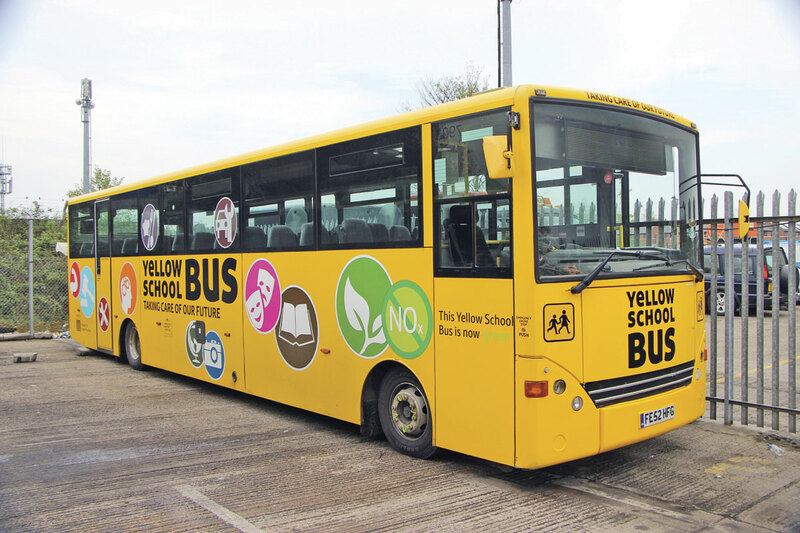 The fleet is dominated by what is almost certainly the largest concentration of Iveco Scolarbus school buses in the country. They are surprisingly solid and additional examples are bought from other operators from time to time. 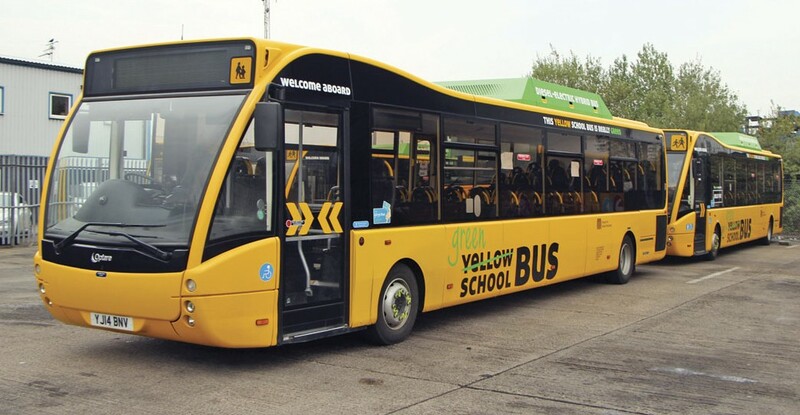 Also operated are the special long Optare Versa hybrids owned by TfGM and maintained by Optare, a fleet of six Mercedes-Benz Tourismos, some Dennis Trident Alexander ALX400 buses and a variety of other models ranging in size from minicoaches to 14m double deck coaches. 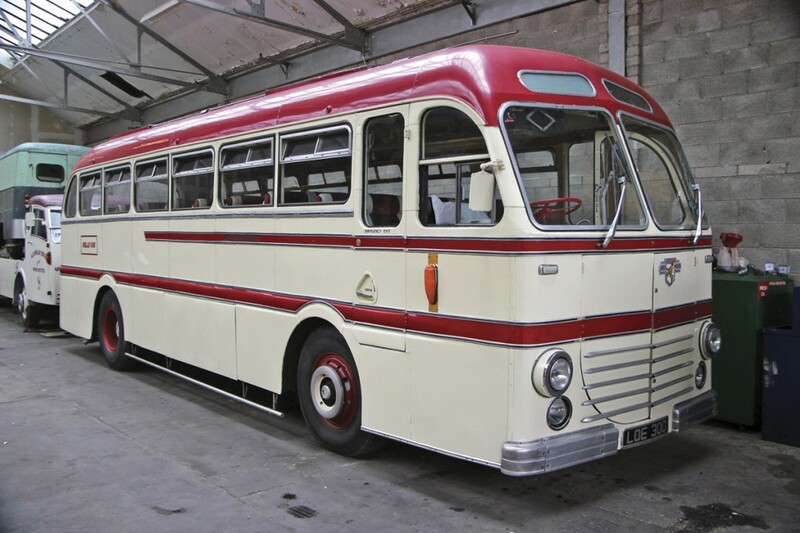 Among the newest is a 65 plate Turas 900 bodied Atego. That he is so fanatical about everything being right for MOTs is not surprising. He points out that you daren’t fail because it is so difficult to get a retest because the stations don’t earn as much for doing them, so they are less keen to. 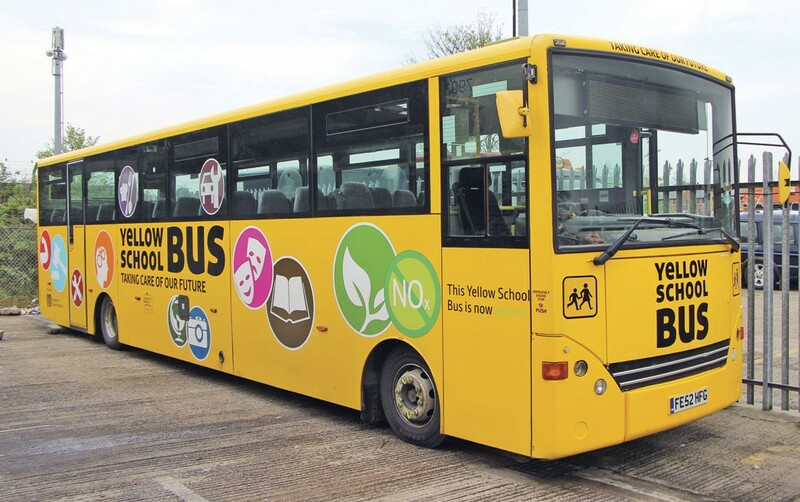 If a bus did fail it might be 14 days before you could get a retest. Learning from Kenny isn’t for ‘wusses’, he admits. ‘I’m a jugular sort of person’ said Kenny, which I took to mean that he likes to get directly to the heart of a problem rather than that he physically goes for your throat! His nickname, carried on his overalls, is ‘The Dark Side’, a description he has earned through his ‘way of expressing myself,’ when crossed or presented with something that does not meet his standards. 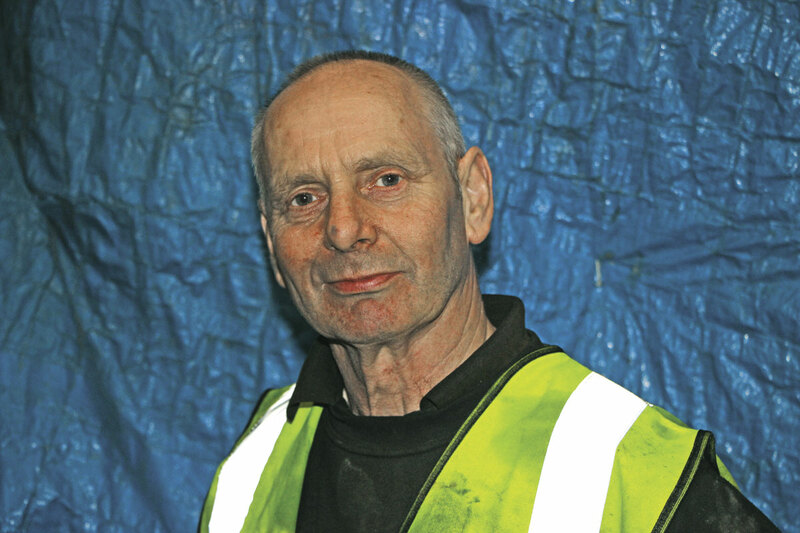 Kenny took on and trained Foreman, Jason Cotgrave, Assistant Foreman, Reece Deakins and Mechanic, Adam Tailby and it is now mainly Jason who trains the apprentices. The team is completed by Night Foreman, Martyn Sanxter, Night Mechanics, Dave Rooney and Danny Jackson, and Robin the painter. Of the apprentices, George is IMI level 1, James is level 2 and Anthony is level 3. Six of the team that are involved in inspections have undertaken the IRTEC advanced inspection course at Manchester College. They have all also had LOLER training for maintaining the wheelchairs on some of the accessible vehicles. Martin and Jason also have PCV licences while Reece and Adam are in the process of qualifying for theirs. Remarkably, Kenny has been married for 39 years to Maureen. He claims that he had a sore throat when he met her so she got the mistaken impression that he was quiet as she is. Why does she put up with him? ‘I wonder that myself?’ he says. She must have learned quickly what he was like because their wedding was scheduled for 11.30 and he didn’t finish fixing a car engine until 10.00 to earn the money to pay for the ceremony at the registry office. Similarly, finishing engines meant that he arrived too late to be present at the birth of either of their children, daughter Tracey and son Kevin. He is now grandfather to Tracey’s daughter Grace and Kevin’s daughters Toni and Leah. He refers to them as his angels, though he says the same of the ladies he works with in the Belle Vue office. He clearly thinks a lot of those he works with, and has established a good rapport with them, even if they do wonder about some of his antics. ‘If we’re his angels, Maureen must be a saint,’ said Head of Business & Operations, Donna Thompson. She describes him, with obvious affection, as ‘a bit of a character’, reciting some of his favourite lines including, ‘build an Empire,’ ‘Let’s kill it,’ ‘Are we enthusiastic?’ and ‘Can you just write this down for me on a ten bob note?’ He is also prone to trying to order a sausage sarnie along with spare parts. ‘He has ways and means of getting people involved,’ she said. ‘I need a volunteer’ is another of his favourite lines. ‘He doesn’t suffer fools and he doesn’t do ill; I don’t think he’s had a sick day in his life. He is one crazy, crazy cookie.’ Donna told me that the two of them had only ever had one altercation, and that she had been in the wrong. I mentioned the Den earlier and on the evening before I visited him at Belle Vue I called in there to see what he and Ray get up to. 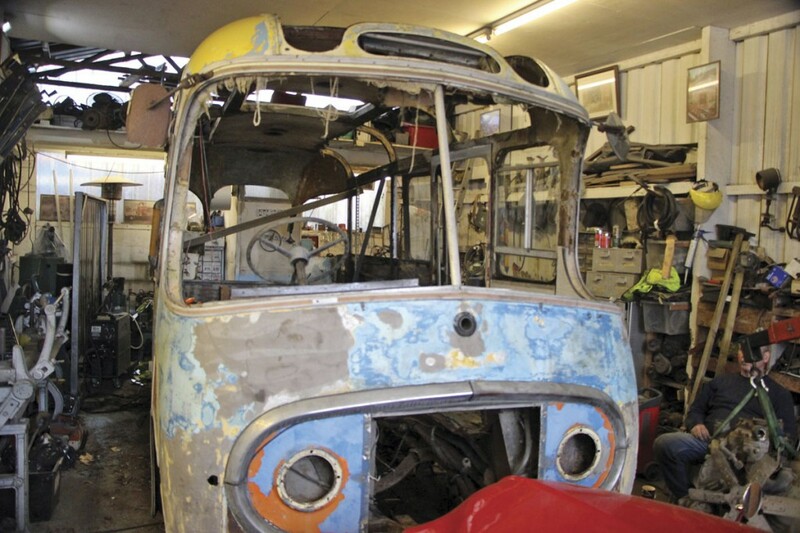 I found them ripping the rotten floor out of a 14 seat Plaxton bodied Karrier coach from 1960. 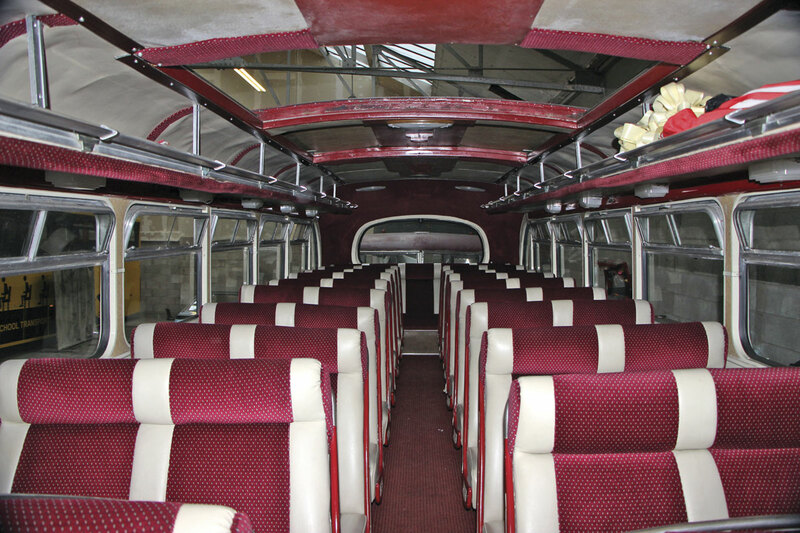 The coach was the first one ever operated by Go Goodwins of Manchester, and as with all projects the Walsh brothers attempt, it matched three key criteria. It is a rare vehicle, it was inexpensive to acquire, and it was what Kenny likes to call ‘nice and bad’. That last phrase translates as utterly rotten throughout, having stood outside, allegedly for the past 35 years. 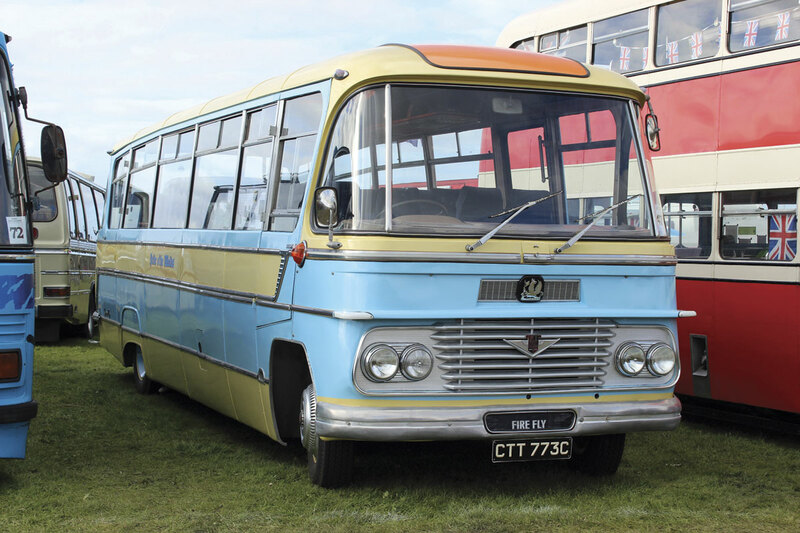 You could easily spend the next ten years restoring it to its former glory, but Kenny and Ray won’t, they’ve set themselves a target of September to have it back on the road with a Class VI test, and they will meet that. On 4 September it will be at an event at Heaton Park. 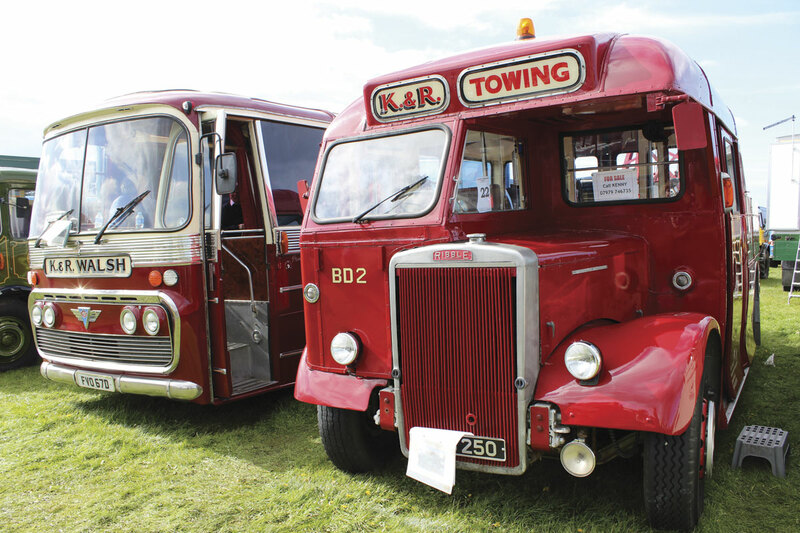 With approaching 50 projects under their belt now, most of them on commercial vehicles though they have tackled the odd car, they know they can achieve the seemingly ridiculous schedules they set themselves. Illustrating the point, they recently completed the total renovation of a Ford D truck in only nine days, though they had done the spare part sourcing in advance of that. Most preservationists take one or two vehicles to a rally; the brothers might take half a dozen with a little help from their friends. 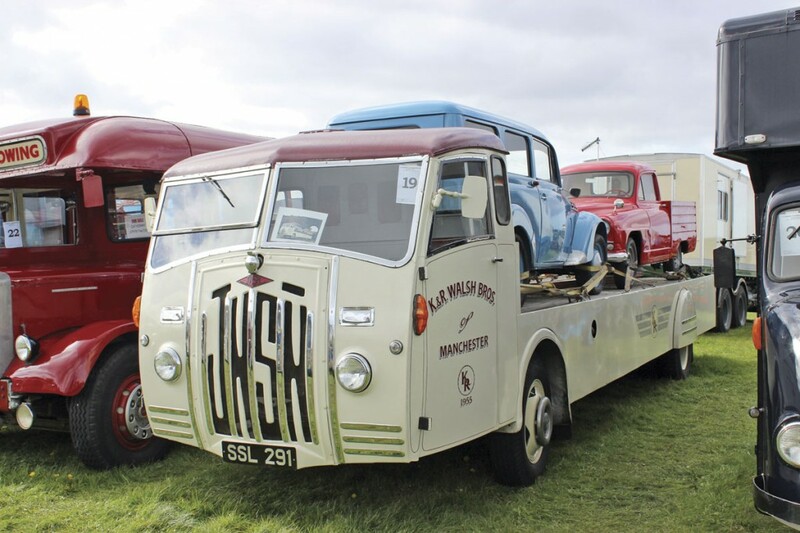 Not only that, but those they take will be different from year to year, because ‘once we’ve done a season we get bored with them so we sell them on.’ There are exceptions that have been kept, including the one and only surviving operational Jensen lorry of that type. It is used to carry cars as a transporter. An acquisition model the brothers often use is to pay £1.00 for a wrecked vehicle and offer the current owner first refusal when they have done it up. ‘It’s not about the money, it’s the challenge,’ said Kenny. 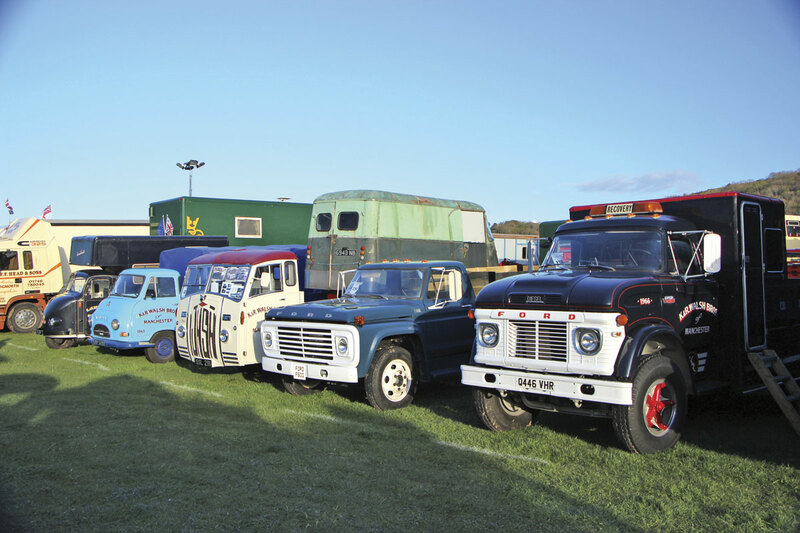 In a divergence from restoration, they once built an entirely new truck from scratch using the remnants of a Commer chassis and bits from every other truck brand you can think of. They loved the confusion it caused at rallies. 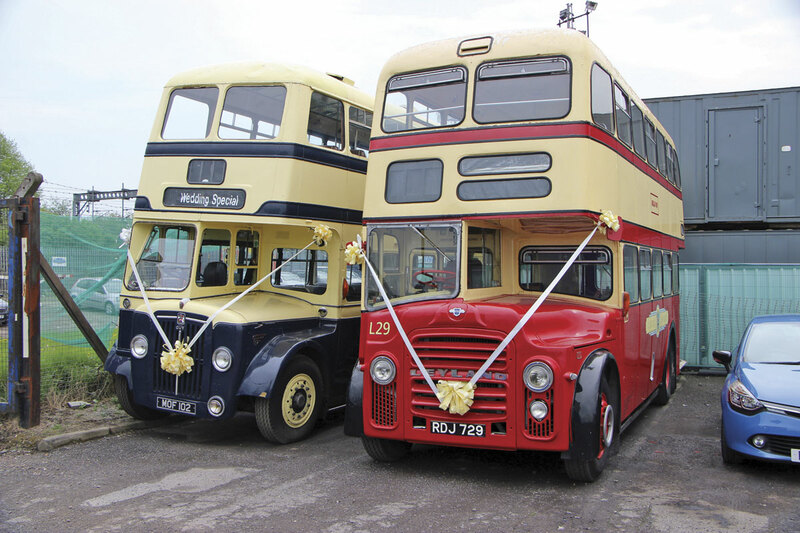 Kenny’s leisure time interest has spin off benefits for the Belle Vue fleet which offers heritage buses for weddings and other specialist jobs. 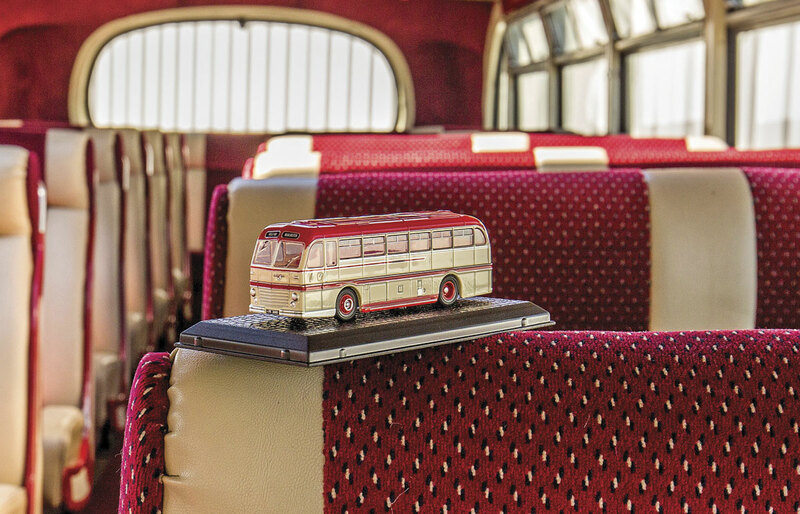 Two double deckers are a former Birmingham Corporation Guy Arab of 1954 and a former St Helens Leyland Titan PD, both of which are popular, but the real star is the last Duple Roadmaster bodied Leyland Royal Tiger, a model immortalised by Dinky who produced a popular model of it in the 1950s. Restoration of the Roadmaster was a joint venture between the brothers and Belle Vue as it was also used to develop the team’s skills. Another benefit for the company is that a Volvo F86 bonneted wrecker truck the brothers built out of two wrecks is available for appropriate recovery jobs, though the company uses specialists if necessary. 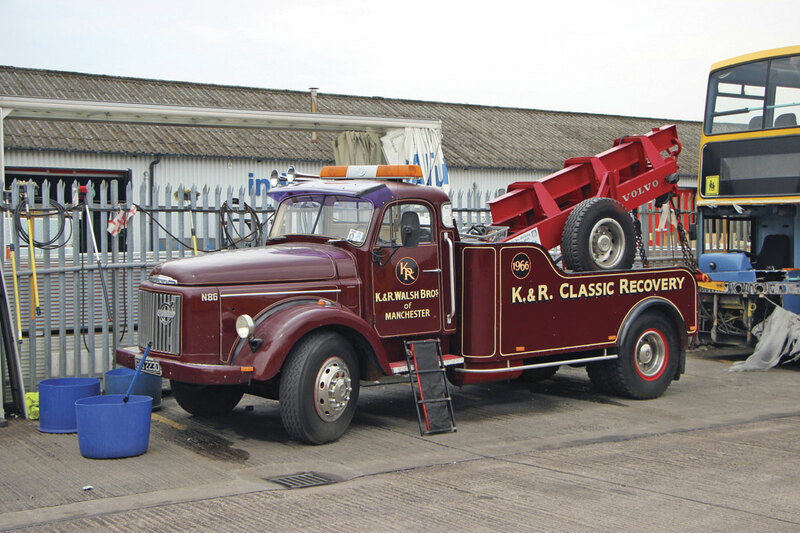 www.krwalsh-classics.com website which Ray looks after. Unusually for someone in Manchester, Kenny has no time for football. He did once try to learn golf and after two lessons he still couldn’t hit the ball properly. The ball kept going sideways. It was at this point that he asked whether it made any difference that he was left handed. He didn’t pursue the game. 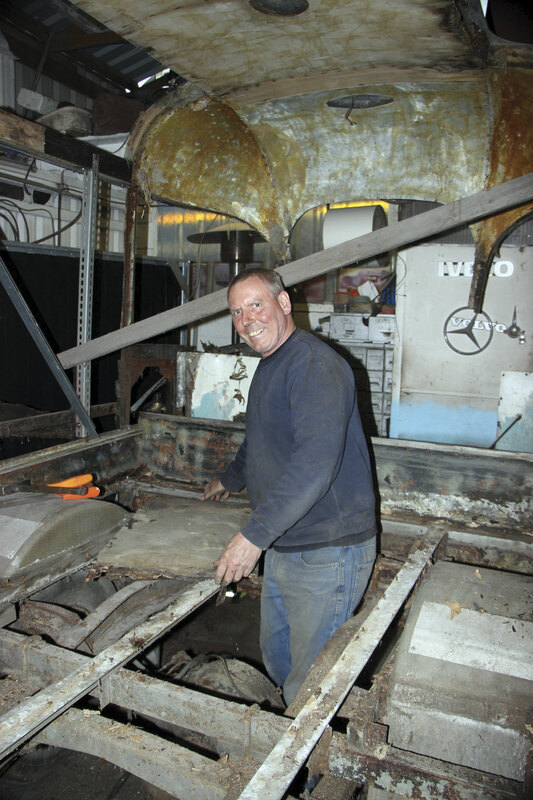 His left handedness is something that he claims annoys brother Ray, and although they spend hours working together on projects and get along fine, they rarely work on the same side of the vehicle or the same task simultaneously because they don’t coordinate well. 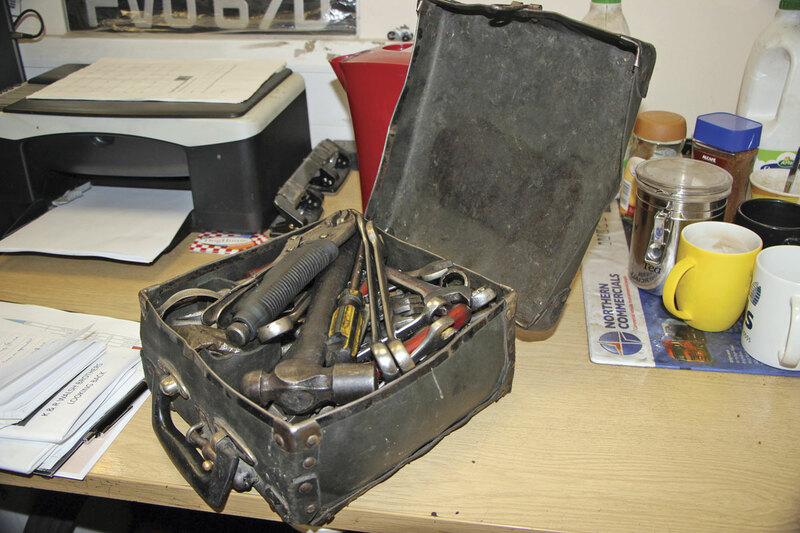 On another job, Ray had fitted an internal door handle to assist in entering the cab and Kenny couldn’t use it because it was in the wrong place for him. A discussion ensued, after which Kenny called in a third person to arbitrate. He demonstrated that Kenny was indeed correct about where the handle should go, though it might have been fairer of Kenny to mention that he knew the arbiter was also left handed. Another trait of his that goes back a long way is that he eats very quickly. In his first job it had earned him the nickname ‘Animal’ when the boss challenged him to eat pie and chips quicker than his Alsatian and he won, allegedly because, unlike Kenny, the dog couldn’t blow on his hot chips. He still eats quickly, and Donna has plans to enter him for a pie eating competition in Wigan next December because she is sure he can break the current record, as is Kenny himself. It won’t be pretty. It is a measure of what he thinks of his co-directors and those he works with that Kenny has now been with Belle Vue for 15 years. Previously, he had only ever stayed anywhere a maximum of five years before moving on. In that time Belle Vue has grown from five vehicles to 68 at the last count. 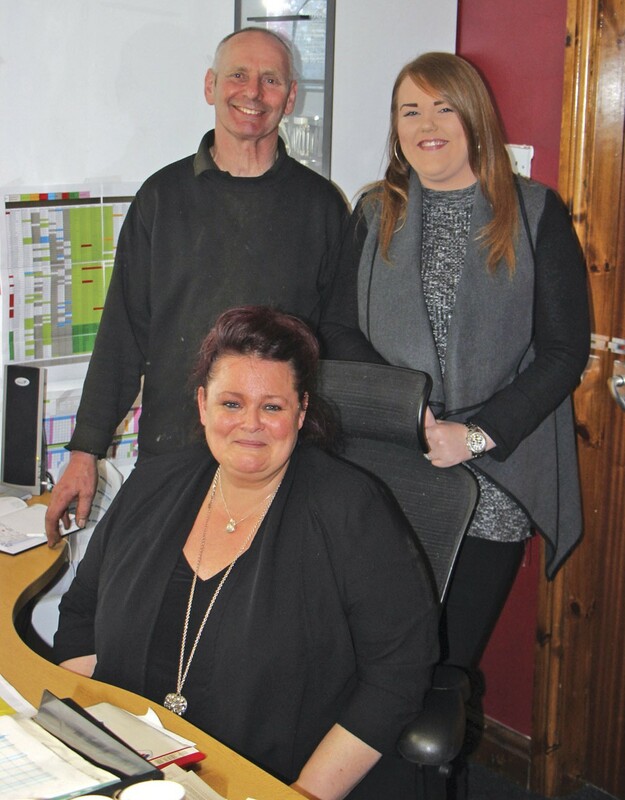 He likes the positive atmosphere at Belle Vue and those he works alongside. ‘They’re characters; it suits me,’ he said. Referring to the preserved commercial fleet, he is philosophical. Ray’s three sons can’t drive and his son Kevin says that when Kenny dies he will weigh them all in at I.J.Kaye’s, the local scrapyard. Whether that happens or not, Kenny will have left his mark, not only on a lot of old vehicles that wouldn’t otherwise still be around, but on those he has trained and worked with who, I can say with total confidence, will never forget him.